My dad used to always say, “It’s better to build a guardrail on a curve than a hospital at the bottom of the hill.” As an adult, I’ve come to understand that wisdom of his words. We all want to rescue someone after they’re hurt. But isn’t it better to protect them from harm in the first place? Today, as the president of World Concern, I have an opportunity to put my dad’s wisdom into practice. Our focus is on disaster risk reduction: equipping vulnerable communities for a disaster before it happens, and taking practical steps to minimize its destructive impact. We work to provide infrastructure within and around a community to protect its residents from disaster. This is far better than repeatedly helping them rebuild… and grieving with families who have lost loved ones in a devastating earthquake or hurricane. 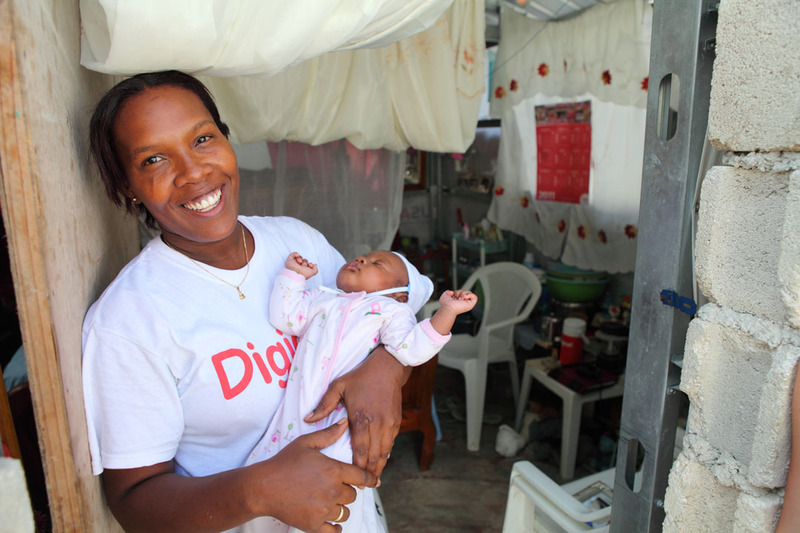 Mercila no longer fears disaster in her village along Haiti’s northern coast. She is helping her community prepare for future disasters. Mercila’s story is a great example of how communities can protect themselves. “When there is flooding, the houses fill with water and people lose many things. 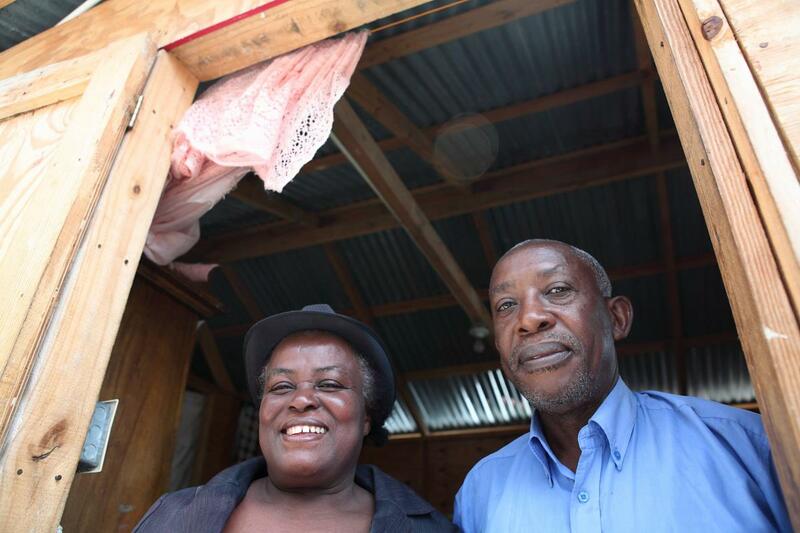 When there is a hurricane… houses are destroyed,” said Mercila, a young mom who lives in Haiti. Hurricane season comes every year, and her village’s precarious location along Haiti’s northern coast leaves the entire community vulnerable to frequent natural disasters. Mercila’s village has a new storm shelter where families can stay safe during a hurricane. World Concern is taking action to keep everyone in Anse-á-Foleur safe. We’ve trained Mercila as an emergency responder for her village. Now, she is teaching her entire community, passing along all the disaster preparedness training she’s received. The community was equipped to establish an early warning system to alert villagers of coming danger, and built rock walls along the river to prevent flooding. They also constructed a storm shelter, so families will have a safe place to go when a hurricane is near. but many others in vulnerable communities are living in the path of destruction. Families in Bangladesh, for example, know that the month of May brings another cyclone season… and certain destruction. Together, we can help them prepare and survive. Kanomrani’s family lives in a coastal village in Bangladesh that is in the direct path of cyclones. You can help protect a family like hers from the storms ahead. World Concern will always be there for those who are suffering after disaster. But it’s a wise and critical investment to protect vulnerable moms, dads, and little ones from future disasters. Young girls collect water from a public source in Grand Gosier, Haiti. Those who don’t live nearby will have to carry these buckets of water home. World Concern makes providing clean water to communities that lack this life-saving resource a top priority. Recently, we visited the Southeast Department of Haiti and saw the direct link between disasters and the need for clean water. We joined Bunet, World Concern’s Disaster Risk Reduction Coordinator, on this trip to Grand Gosier to see how we are providing clean water and preparing communities for future disasters. Grand Gosier is a rather isolated commune (cluster of communities), near the sea and the Dominican Republic border. One reason it is so isolated is because of the poor condition of the road that leads to it. From Jacmel, the big city in Southeast Haiti, you must travel approximately 84 kilometers east to reach Grand Gosier. Those 84 kilometers took us over four hours. While crawling at a snail’s pace can be exhausting, the views are stunning. This is one contrast I noticed on the trip–poor infrastructure yet stunning natural beauty. Once we arrived in Grand Gosier, we caught up with Pierre, the coordinator for the project in this commune. He explained that the water system for the area had been damaged by a storm in 2007. Since then, those not fortunate to live close to the water source have been forced to spend a lot of time and energy walking to reach water. Even while we were visiting with Pierre, children and women walked past us carrying water. All kinds of jugs, bottles, and containers are used to transport water. Women and girls carry water on their heads while workers replace the old PVC pipe to the community’s water source. Occasionally we saw someone guiding a donkey, loaded down with water, but the majority of people were walking. It was early afternoon, and limited cloud cover meant it was a hot and dusty journey for them. Soon, those long journeys will not be necessary. Once finished, the project will provide nine water collection points throughout the commune which will shorten the walk to water for many. As we were listening to Pierre speak about the project, I wondered what precautions were being taken to ensure that this time the water system will be more resilient to withstand the next storm. Hurricanes and heavy storms are all too common in Southeast Haiti. Hurricanes Isaac and Sandy in 2012 are the most recent reminders of the devastation such storms can cause. Combined, these two storms killed 87 and affected 205,623 people. We cannot stop the rains and winds from coming, however we can be sure that communities are prepared as best as possible. The new metal pipe, which you can see here, will ensure clean, safe water reaches families in this community, even when storms come. Pierre explained that the prior water system had used PVC for the piping, but his team is working to replace all the PVC with metal pipes. Though a seemingly small step, using metal will be a huge step towards increasing the system’s – and the community’s – resiliency. When the repairs and construction are completed, this water system will provide clean water to people, whatever storms come their way. You can help protect families and their resources from future disasters. Donate today. Chris Sheach is World Concern’s Deputy Director of Disaster Response. He’s blogging from Haiti on the third anniversary of the earthquake. One of the 200,000 homes and 30,000 commercial buildings that were destroyed in the Jan. 12, 2010 earthquake in Haiti. It was three years ago today that a 7.0 earthquake devastated the city of Port-au-Prince, Haiti. We in the humanitarian community were shocked at the severity of this disaster. Almost 3.5 million people were affected by the earthquake, close to a quarter of a million died, and 2.3 million people were left homeless. The estimated $7.8 billion loss is equivalent to 15 months of Haiti’s GDP. All this in a country where the average family’s annual income is $660, 58% of the population lacks access to clean water, and more than half of the children are under-nourished. This was a disaster decades in the making, and it’s certainly not going to be an easy fix. I’ve spent the last week in Haiti, looking at some of the work World Concern has done, and working with our staff here in Haiti to develop the way forward. Coming back every few months, as I have for the last three years, I have seen continued progress and constant change. World Concern built more than 2,000 temporary shelters in the first 18 months after the earthquake, and this week I was hard pressed to find one—not because they’ve deteriorated, but because people are going beyond their temporary situation, improving and rebuilding their homes, moving along the road to the future. This does not mean that it has been easy. Recent news articles emphasize the long road to recovery, filled with potholes, roadblocks and detours. A road complicated by mismanagement and conflicting priorities. The dog in Haiti is a symbol of resilience and perseverance. If you’ve been to Haiti you know why. Stray dogs are often stepped on, starved, and rejected, but they just keep surviving. As it was explained to me, “A dog just keeps walking and walking, and it always gets where it’s going.” Haitians don’t expect the road to recovery to be a sprint, but rather a marathon. They will keep moving forward, step by step, until they reach their destination. And we plan to walk this road with them. A mom washes clothes in her transitional shelter World Concern built after the earthquake in Port-au-Prince, Haiti. Many families have turned these into permanent homes by making long-term improvements to the structures. World Concern is shifting our focus from disaster response work in Haiti, as we continue to take steps along the road. Disasters are too common in a country with less than 2% forest cover, poor sanitation infrastructure, and unsafe building practices. Regular tropical storms cause flooding, soil erosion, landslides and collapsed buildings on a yearly basis. With the help of our donors, World Concern engages communities in reducing their risk to these disasters. Earthquake, tsunami and hurricane preparedness is being taught in schools, and spread through community groups. Early warning systems, flood control, and improved sanitation systems are being established. Schools and churches designated as evacuation centers are being retrofitted to ensure their stability. Local disaster response committees continue to plan, prepare, and train their communities. Building resilient communities enables Haitians to continue to persevere—and to move beyond their current vulnerability. The earthquake was a significant setback on the road to progress. some estimate that 10 years of development were lost. We want to ensure that, even if natural disasters happen, they are not as debilitating. The road may be long, but we must continue to walk it, no matter how long it takes. I am grateful for donors that continue to support World Concern and the people of Haiti on the road to resiliency. You can help protect vulnerable families from disasters and help them prepare: www.worldconcern.org/preventdisaster. My mouth dropped open when I read the words of ABC News reporter Amy Bingham in an article about the potential effect Tropical Storm Isaac could have on the city of Tampa as the Republican National Convention kicks off there on Monday. Most of the commenters on news stories like this made fun of the fact a storm was bearing down on a group of Republicans. Nadѐge Moise and her family live in a rural village in the mountains of Southern Haiti, an area that has been severely damaged by hurricanes. Tropical Storm Isaac is expected to bring 12-20 inches of rain to this area this weekend. But my shock was over the complete lack of regard for the people of Haiti who are in real danger. “Under the best case scenario, the storm could smash into the mountains of Haiti … then the weakened storm could sweep over the Bahamas and swirl off the east coast of Florida … missing Tampa…” wrote Bingham. Seriously? A storm smashing into the mountains of the poorest country in the Western Hemisphere is the “best case scenario”? I was just in those mountains of Southern Haiti in June. There are families and communities in those mountains who are extremely vulnerable to storms like this. They all talked of the terrible flooding that overtook their homes and villages in 2008 when four hurricanes hit Haiti. They are terrified of disasters, and because of their remote rural location in these mountains, most of them probably don’t even know another storm is coming their way. I was glad today to see NBC News and a few others focusing on the danger to Haiti. If Isaac continues on its current path and strengthens into a hurricane, it will likely cause much damage to the homes and lives of the millions of people who live in Haiti. World Concern is preparing staff members in Haiti and gathering emergency supplies to respond. Children in Côtes-de-Fer, a village near Bainet, along the southern coast of Haiti, stand near a canal built by World Concern in 2010. The canal is part of a disaster risk reduction project and is designed to direct rainwater away from homes and into the ocean. We’ve also been working to reduce the risk to communities in this region, like Côtes-de-Fer, a village near Bainet, along the southern coast of Haiti. 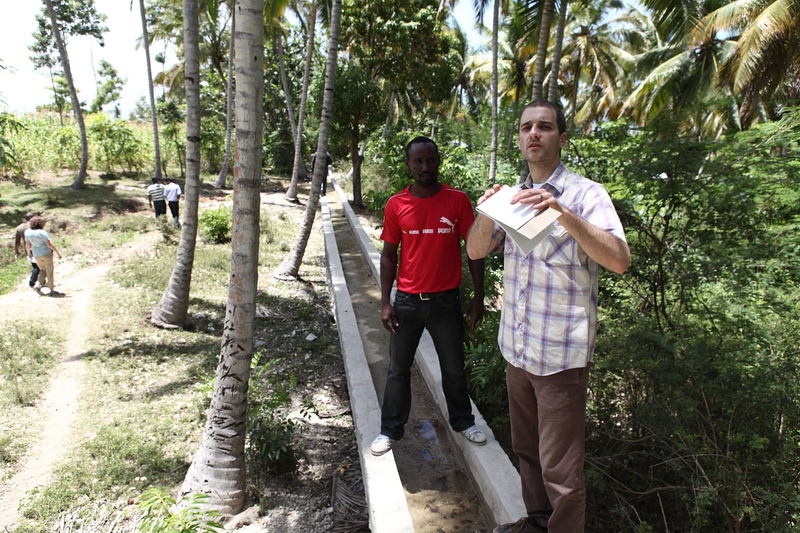 We worked with community members to build a canal in 2010 that is designed to direct large amounts of rainwater away from homes and into the ocean. But even communities with canals are at risk because Isaac is expected to dump more than 12 inches of rain—possibly up to 20 inches—on Haiti today and tomorrow. Please join me in praying for the people of Haiti, World Concern staff and others who work in this area, and all who will be affected by this storm. Learn more about our disaster response work, and partner with us to bring immediate help to families in need. In response to Deborah Sontag’s investigative report on the state of housing for earthquake survivors in Haiti, I wanted to expound on why building permanent homes is so challenging and revisit the idea of transitional shelters (T-shelters) and repairing damaged homes as ways to provide shelter for the homeless after a disaster. Twelve extended family members live in this home, two T-shelters built side-by-side, in Port-au-Prince, Haiti. The home has a concrete foundation, wood walls on the upper half and a metal roof. In countries like Haiti, between one-third and one-half of the urban population lives in informal slums, essentially trespassing on government or private property. Many of these shelters are well below the minimum humanitarian standards to which aid agencies adhere. While working in informal settlements in Port-au-Prince, World Concern found that many people preferred the cramped quarters of a one-room shelter for large, extended families over the option of moving out of the city, away from jobs, transit and markets. In other words, moving people to outlying areas where large pieces of land might be developed for housing is not the best solution. T-shelters are intended to last three years, with the understanding that a permanent housing solution will not be available before that time. It is important to note that the alternative is replacement tents every six months, which would cost approximately the same amount over the same time. World Concern was one of several agencies that focused our work on repairing more than 2,000 damaged “yellow”-coded houses. Where houses could not be repaired, World Concern developed T-shelters with a permanent foundation, providing homeowners with a solid beginning on which they could build earthquake resistant housing within their own means. An independent report prepared for USAID concluded that, of the 894,588 people who fled to camps in the days after the earthquake, more than 85% had returned to their homes by May 2011. This report concluded that there are many in the camps who are “hoping to take advantage of the aid; not necessarily renters.” This same study showed that yellow and green houses had a return rate of more than 95%, including renters. One of the key contributions of foreign aid was the removal of more than 5 million cubic meters of rubble from the streets, walkways and private properties of Port-au-Prince. More than 50% of homes would not have been accessible without this work, and the cleared roads have enabled construction crews to rebuild more quickly. An earthquake victim stands inside his home, which was yellow-coded after the earthquake. World Concern repaired the damage so he could move back in safely. Demolition of condemned buildings is not only expensive, but it’s a time consuming process. Many of these buildings are multi-story rental units or larger homes of wealthy families. Some of the latter have left town or even left the country, leaving a condemned building with no hope for new opportunities. Other landowners want the demolition to occur, but are not willing to accept single family units on their plot of land, preferring rather to wait until they have enough funds to replace the multi-story complex they once had. Land rights are an important part of democratic rule of law. If a former landlord refuses to rebuild, or to accept the affordable housing solutions offered by aid agencies, that is their prerogative. It also takes time to work with the government to implement aid. Before the earthquake, Haiti did not have an urban redevelopment plan, so agencies have worked with the government to ensure an enforceable strategy is in place, rather than willy-nilly construction which creates a new hazard for the future. This strategy, while slow, is seen as the only way to prevent the cycle of calamity repeating itself again. After the 2004 earthquake in Banda Aceh, it took more than five years to replace 140,000 homes. After two years, Port-au-Prince is only just shy of the same average rate of construction, with most of the heavy lifting already done. While there is much more to do, the dream of safe housing is much closer for most Haitians than it was before the tragic events of 2010. 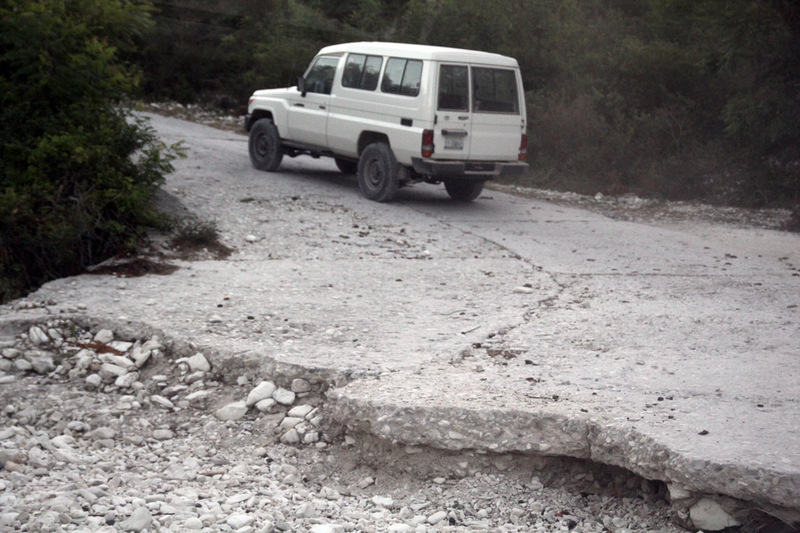 The rural roads in Haiti are steep, bumpy and long. World Concern reaches communities on some of the roughest roads in the country. The bumpy roads here in rural Haiti toss you around like a bull rider. Hairpin turns wind you through steep mountains, striking even the toughest travelers with motion sickness. And the roads seem to go on forever. Just when you think the road couldn’t go any further, it keeps going. A sense of dread came over our team visiting Haiti this week when one of our Haitian staff informed us, after 7 hours on these roads, that we were about to go on “the worst road in Haiti.” We thought it couldn’t possibly be any worse than we had experienced. But it was. Dust and dirt swirled around us as our Land Cruiser lurched up rocky mountains with cliffs on either side. It is at the end of many of these roads, far beyond where most are willing to go, that World Concern works. When our vehicles pull into villages, children wave and grin excitedly. The leader of the community often greets our Haitian staff warmly with a hug of recognition, signaling relationships that have been formed over time. People who live in these remote communities are grateful because someone has come so far for them. Mothers whisk their children home to put on their best clothes. Little girls in dirty, torn shorts and T-shirts return wearing frilly dresses, looking more like they’re going to a wedding than meeting visitors. Parents talk openly about their struggles: not having opportunities to earn income, lack of clean water, and sick children. Some fear earthquakes and flooding will threaten their lives again soon. They are strengthened by the help they receive—not a handout, as it is starkly obvious to those of us visiting that this would not change anything. This kind of widespread, extreme poverty, requires a long-term, well-planned response—the kind of help that brings the chance for something different. A better future. This irrigation canal, built by community members with the support of World Concern, helps prevent flooding in a rural village in Haiti. The water is channeled to irrigate crops. “If we have water, we can do anything,” said one farmer whose community has a new canal that channels rainwater away from homes and into the fields where it waters crops. “Education is the key,” said a second grade teacher who has served his village since 1995. These people tell us they want to learn new ways of doing things. They don’t want handouts. They want changes that will last. They want to do the work themselves, with our support and assistance, but they want ownership over the projects. This is where you come in. You don’t have to go to the end of the road to help. We invite you to witness the transformation in Haiti by supporting the work of World Concern. We’re encouraged on days like this, to know that even at the end of a tough road, real and lasting change is possible. 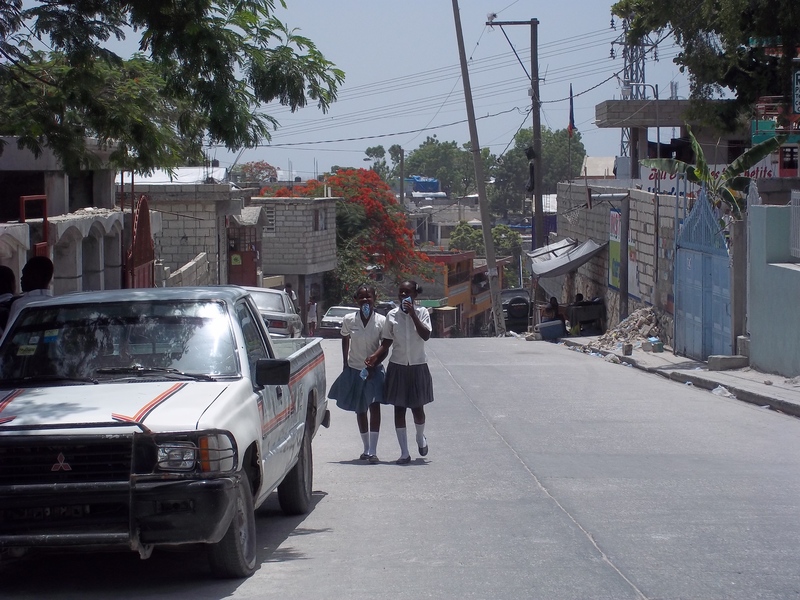 School children in clean, pressed uniforms walk home from school in Port-au-Prince, Haiti. It is beautiful here in Port-au-Prince, Haiti. That’s not something I imagine many Americans say on their first visit to this city—the poorest in the western hemisphere and home to about 3 million people. I expected it to be ugly, foul-smelling, really hot (which it is), and scary. Blue skies blanket this city, and blooming fuchsia-colored bougainvillea drape over concrete walls that protect homes and buildings from the chaos on the other side. The smell of spicy grilled street food fills the air. Narrow, unpaved roads wind through hilly neighborhoods. The streets are clogged with honking vehicles and pedestrians who seem oblivious to cars and trucks swerving around them at terrifying speeds. Sidewalks are lined with vendors selling everything from shoes to dish soap. But these are not the things that make it beautiful here. This is the kind of beauty Isaiah describes in 61:3—the kind that comes out of ashes. Much of Port-au-Prince was reduced to dust in 2010 after a powerful earthquake crumbled its fragile cinder block structures. The city became a massive concrete grave for 230,000 people. There are still piles of rubble every few blocks. Things have been cleaned up, but at first glance, it looks as though not much has been rebuilt. To me, the chaos here is beautiful. The people here are beautiful—children in pressed uniforms and women carrying huge baskets filled with heavy loads on their heads. Mothers washing children’s clothing in metal tubs of soapy water. Families are starting over, making homes out of simple shelters. Elias (right) and Louis live with 10 other family members in the home World Concern provided for them. They say the help was a "gift from God." The concrete floor is swept clean and the bed is neatly made in the home of Elias and Louis, a precious couple in their late fifties who welcomed us in, offered us a seat on the bed, then put on their best clothes to have their photos taken. A thin curtain separates the two shelters that were built together by World Concern so that the family of 12 could all live together. Their home is one of more than 3,000 World Concern has built or repaired after the earthquake. They are retired teachers who lost their home in the earthquake. Louis rested her hand on her husband’s to try and still his trembling caused by Parkinson’s disease. Elias got tears in his eyes as he talked about their life, their losses, and the blessing their home has been. Our eyes met and our hearts connected as we shook hands and thanked them for sharing their story and inviting us into their home. “God bless you,” said Louis, in perfect English. Strength for fear. Joy for mourning. Praise instead of despair. We join with them in thanking God for the transformation that is happening in Haiti. Loueze Berlien proudly shows visitors around her one-room 12-by-12-foot transitional shelter she received from World Concern. It’s simple, she admits, but it’s much safer and far more comfortable than the tent on her cousin’s property she’s been living in since the earthquake. She was pregnant when the earthquake destroyed her house. She escaped with only minor injuries from falling debris, but her husband Patrick did not survive. Loueze Berlien lost her husband in the earthquake. She and her baby now have a place to call home. Loueze was grateful when she learned she would receive a shelter from World Concern. “It was a way to restart my life,” she said. Now, she and her baby have a place to call home. The initial recovery that takes place in the months following a disaster is often dramatic. Although the progress in Haiti since the devastating earthquake two years ago has been challenging, it is, nonetheless, remarkable. 1.5 million people were left homeless in a country with an already strained infrastructure. 250,00 homes were destroyed. Two years later, a million of those who were homeless have been housed. And five million cubic meters of debris have been cleared from narrow streets – most impassible by vehicles. Immediately following the earthquake, people needed tools to survive – water, food, first aid, shelter. Having worked in Haiti for more than 30 years, and with a warehouse full of emergency supplies, World Concern was able to help save lives by meeting these immediate needs. World Concern hired local workers to repair more than 2,500 damaged homes so families could move back in. We put people to work, clearing rubble, and paid them cash so they could feed their families. Business owners received grants to buy equipment and inventory to restart their businesses. And we built and repaired homes – more than 3,000 of them – like the one Loueze is living in now. There’s still a long road ahead for the people of Haiti, but they are resilient. Despair and shock have turned into hard work and hope. The economy is improving. A million of those who were homeless are now in shelters. And new homes are safer. Aid organizations are shifting their focus to preventing another catastrophic disaster. 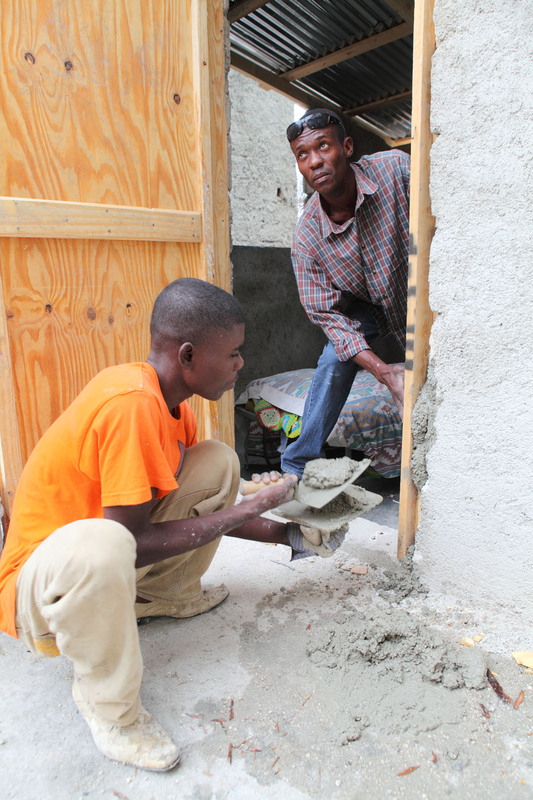 There’s no doubt, Haiti is building back better.